and the first article here. Personification is a source of Japanese pride. Honda’s research into visibility and road safety prompted motorbike design choices including a kabuki-inspired chassis and lighting. Did this discovery herald a new era of aggressively-stylised vehicles and intimidating road traffic? Exploring the trend of personification, we can answer this question. Post 9/11, motorbikes modelled on such fearful, intimidating designs seemed to perform very well in the marketplace. The climate of fear had created a demand for rugged, “Survivor”-style vehicles. Let’s look at Dodge’s flagship SUV of that era, the Durango. With the accentuated, formidable front wing design, it resembles the stocky, macho build of a predatory beast rather than just a means of transportation. This superiority in build likely intimidates other road users and benefits the driver in potential collision situations. Yet this intimidation represents a problem. Once we realise the interconnected nature of road users, it is essential to consider and manage our influence on others. Consider the intimidating motorbike with improved visibility. If another driver feels antagonised and provoked into responding aggressively, the probability of an accident will increase irrespective of improved visibility. Given their speed and lack of protection, motorbike riders are clearly vulnerable. In a collision with a car or SUV, they would be worse off. For this reason, improved visibility at the expense of heightened tension is not sufficient. One of Honda’s researchers, Koichi Maruyama, claimed the reverse trend is preferable: “Like a truck, strong vehicles with more gentle traits and characteristics are almost certainly more desirable”. If we consider harmonised traffic in comparison to nature, we commonly see large, strong animals with calm figures, alongside smaller creatures with unique markings and warning signs. Evolution has proven this approach to survival. Natural harmony is the equilibrium for the peaceful co-existence of different species. Applied to traffic harmonisation, this means the coexistence of all road users in a functional way. Let’s explore the ways we self-assert our physical presence without alienating those around us. Full consideration of the interaction between ourselves, each other and our surroundings can better harmonise them, leading to the development of improved interfaces. Widening our consideration of personification of human traits beyond just fear, let’s consider the smiling, happy face of a baby. An emotional ploy or not, adults fall for the irresistible cuteness and charm every time. Such “baby schema” were discovered in 1973 by Konrad Lorenz, Nobel Prize winner in Physiology or Medicine. Can this effect be applied to product design? Such schema work to create an irresistible impulse to adults that can be applied to products. Creating a first impression that effortlessly draws in the consumer is an important design skill. In Tokyo, cute childlike characters and mascots adorn the streets, waiting to catch your attention. Round faces, large eyes and cute features are fundamental design rules here. Adopted by young, trendy Japanese people, this “kawaii” cute culture is now a global movement, far more popular than its Shibuya/Harajuku origins could have predicted. Hello Kitty is now a global brand, worn by supermodels and celebrities, shunning its childlike, young girl image in favour of a more adult, sophisticated “Cool Japan” association. Cute aesthetics have influenced the Japanese car market. 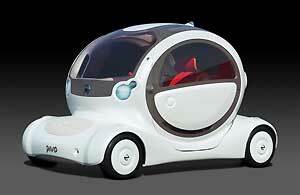 Nissan’s 2005 Pivo is perhaps the most extreme example, a cute kei car aimed at the modern, young, urban woman. But even the Honda Civic of 1973 or the Toyota Prius of 1997 were both quintessentially cute by design. Given the rising elegance of the European car market and the growing macho design of the American car market, Japan needed to exploit the concept of harmonisation through consistently cutifying its designs. The idea of baby schemas has positively influenced Japan’s manufacturing output and can continue to do so. Today’s Shibuya girls would definitely agree the original Civic was incredibly cute for its time. Walking through Tokyo’s Shibuya and Harajuku, the global mecca for cute culture, the streets overflow with cute characters. Yet we have already arrived at a stage where cute culture has spread around the world, where cute aesthetics are weaved into manufacturing at every corner. Through Honda’s research into traffic harmonisation and f-MRI analysis, we can analyse Japanese manufacturing to see the influence and potential of such trends as “personification” and “harmonisation”.